Following on from her earlier words of wisdom, Dr Kate Silvester shares her thoughts on how private practices can benefit from managing their systems properly and avoiding all the most common mistakes that are all too easy to make. It’s all about recognising your problem for what it is and being prepared to do something about it. 1st part of the article is here. 2nd part of the article is here. What advice would you give for private GPs who are looking to set themselves apart from their peers? Understand that it is just as important to understand the physiology and pathology of your practice as a System as it is the physiology and pathology of your patients as systems. I see private companies coming into healthcare and they still do not understand how to design their systems to meet their demand. A lot of the private practices and GPs around here offer a shorter lead time by having a huge amount of capacity and unaffordable costs for patients. They replicate the NHS system but at greater cost. It still has all the problems and is unaffordable: they often go bust. Look at your demand and design your production system to meet it. That science is just as difficult and necessary as going to medical school in order to understand a human system. The fundamental problem for the NHS is the impact of the policy constraints dictated by ‘policy makers’ who have no understanding of systems, and the issue for many managers and physicians is where do they go to learn an alternative approach? I had to go into manufacturing. My MBA was waste of time and money (and they remain so according to the Economist) and the alternative ‘quality improvement or improvement science’ programmes provided by academic and ‘one-man bands’ miss out on flow science altogether as the teachers don’t understand it! Hence the niche I have found – and those who seek do find the healthcare systems engineers because they recognise what they see when they see it. The provision of healthcare is changing at quite a pace in many areas thanks to medically qualified entrepreneurs and other bright sparks. In your view, what sort of changes are we likely to see in outpatient and primary care over the next 5-10 years? Primary care will be governed by the GPs who respond in person to each patient and define what the patient needs at the first ‘consultation’ whether that be telephone, face to face or consultation. This can’t be done by patients themselves, or nurses, using algorithms because algorithms are not designed to recognise ‘patterns’ between several variables, but doctors are. Once patients have a diagnosis and prognosis, then specific point-of-care testing will allow them to manage their chronic conditions, only contacting their GPs or Specialists when their physiology is not in line with their specific algorithm as defined by their diagnosis and prognosis. What would you say the most successful healthcare providers have in common? They are managed by doctors and engineers working in partnership. Virginia Mason being a good example of this. We are all bound to make a few mistakes here and there when we are learning a new way of doing things. 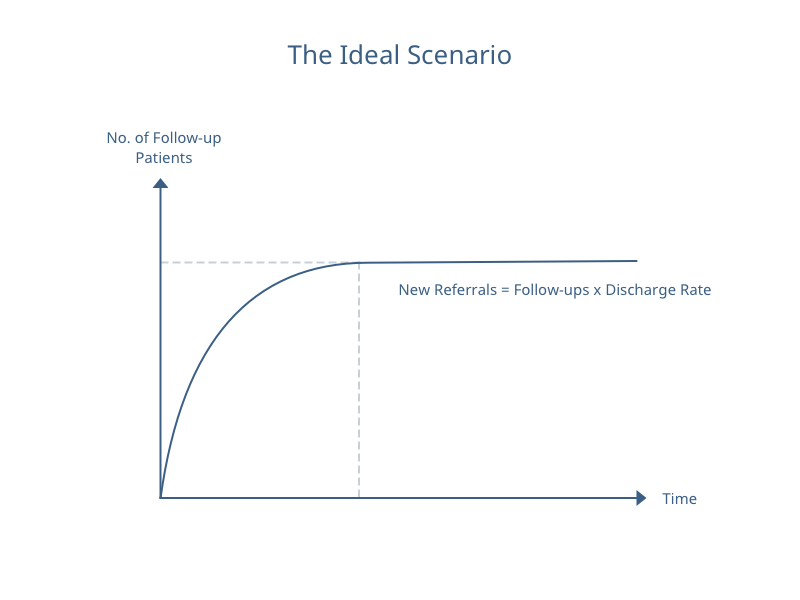 In your experience, what are the most common mistakes that doctors make when it comes to improving patient flow? The doctors remain in a ‘victim’ mindset and they fail to make the diagnosis for the reason behind their stress and the poor flow in their system, and they inevitably blame someone else (often their patients) for the problem. They fail to recognise that ‘I am my problem’. We recognise the enemy by realising the enemy is us, and they fail to do so. ‘You will never solve the problem with the thinking that created it’ Albert Einstein. If you continue to think the problem is ‘too much demand’ then you will never solve it by continuing to try and reduce demand and workload.